The truth about cleaning camera sensors…maybe! Disclaimer - The nature of this article does in no way mean that I condone the repetition of its contents. Nor do I suggest for one minute that anyone copies my actions. This is just to alleviate some of the unnecessary panic and stress when faced with a dirty sensor…its not that bad! I am by no means an expert. The reason I am writing this short article for All Things Photography is not to make any recommendations or suggestions but simply to point out a few facts and mistakes to avoid. So to start - The dirty sensor – How does it happen? Many believe that leaving the camera switched on when changing lenses causes the electronic "charge" to act like a magnet. Leaving it to attract dust that way. I am not so sure about this as the mirror and shutter should be closed anyway. This would prevent any dust being attracted to the sensor at this time. The most obvious reason is probably due to lack of care and attention. Taking the lens off in a clean, wind-free environment is your best bet to keeping things dust-free inside the camera. Any dust that gets in (and it will) during lens changes will eventually find its way onto your sensor over time. This happens the more you use your camera, maybe more so with longer exposures…who knows! Above all else, if you have a dirty sensor and want it cleaned, take it to a pro. I was quoted about £60 by a Canon dealer for the task which is a lot cheaper than replacing the sensor! 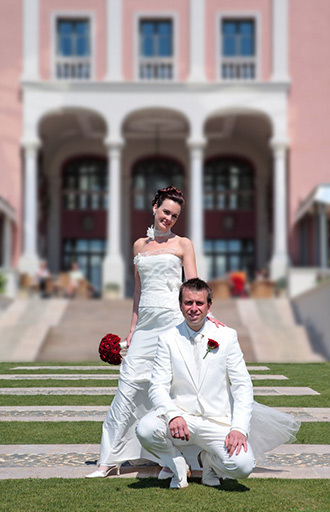 I once shot a small but beautiful wedding at the Ritz Carlton ​in Marbella, Spain (Villa Padierna). Lovely clear blue skies, a lovely couple (both in white!) and tons of great shooting possibilities. Processing was a breeze with bright bold colours and no more spots of dust than normal. I tend to think that I can cope with "healing out" or "cloning" a few noticeable spots away. That is rather than being without the camera for weeks on end whilst it is being cleaned. However, I had another wedding a few days later and I was shooting a preliminary "pre-wedding" meal near the beach and…HORROR! I hadn’t used the camera or changed lenses since the previous wedding. I couldn't for the life of me understand where all this dust had come from. Update: Since writing this I now realise where the dust had come from. I had cleaned the sensor with a blower brush that had been loose in my bag. It had been in hot "sweaty" Spanish weather and constantly inflating/deflating due to being loose and therefore attracting dust inside. That dust had then become sticky due to the moisture which I then sprayed all over the sensor. Beware and look after your blowers!!! I looked at the blue sky on the preview screen and it looked like hundreds, no thousands of flies were attacking the coast of Spain! I used my backup camera but also shot a few with the dirty 5D at wide aperture to try and kill the dust. After painfully processing these images, I decided to have a closer look at the sensor…what a mess! I had another big wedding coming up and needed this camera as my main and had no time to send it away or order a pro cleaning kit (impossible to get in Spain). Now, my mistake was thinking it was just dust and I knew nothing about cleaning camera sensors. I bought a brand new blower brush which was blown and double checked for oil-free cleanliness before use. Then I decided to give just one, gentle sweep across the sensor to try and pull some of it away…doh! All I managed to do was smear the greasy specks right across the sensor making it look like I had just baked a cake on it! I ran around the house swearing and beating up anything that moved (mainly toys and teddies). Then I came to the conclusion that the camera sensor was dead and I would need to replace it. I thought "what the hell"! I then decided to use a swab but in my haste, used the wrong solution and just made things worse. By this point I was a gibbering wreck and I couldn’t help but laugh…not! By now I just didn't care, so I stuck my finger in, wrapped in a lens cleaning tissue with a few drops of solution on it, and just (still gently) wiped away. I changed the tissue every few seconds until I had got through a whole packet of 25. Lastly I used a brand new lint free lens cloth and gave it a polish. About 2 hours later…bingo! I studied the sensor under a bright light and it looked almost new (note that…almost new) and I took some test shots. I aimed at our white wall and used bounced flash with a setting of F9 and 50th/sec and took some shots. Upon studying the results in Photoshop I concluded that it was no worse than when I first got the camera. Just a few specks that I can live with until the wedding season is over. I could then send it away for a professional clean! Running around the house, I took back all the bad language and healed all the toys I had previously beaten up. Whilst giving a huge sigh of relief. Do you have a dirty sensor that isn't too bad and doesn’t really show up in your photos? Live with it and don’t panic. If it is very dirty and you have the time, send it away to be professionally cleaned. If you want to clean it yourself, get the right equipment. Follow strict guidelines which you can find all over the internet (I may add my own one day). Lastly, don't worry about touching the sensor itself. It is normally covered by a sealed, thin, low pass, glass filter which can also be replaced before you need to worry about the actual sensor. You will read all sorts of horror stories on the net about cleaning camera sensors. Do not be afraid, they are not that bad, just be careful!